Last summer I attended Sound+Environment 2017 a conference at Hull University for artists and researchers exploring the relationships between sound and the environment. I was there with Annie Mahtani and together we performed as SOUNDkitchen. We played a 30min set using field recordings from a trip to São Miguel island in the Azores combined with live electronics. We performed on HEARO, the Hull 30 channel loudspeaker orchestra using ambisonic sound spatialisation and made an ambisonic recording of the performance. The track features calls of native wildlife, the interactions of wind and water on the natural and build environment and the sound of human activity and technology. I’m happy to announce the release of ‘Ilha Verde.1’ on Bandcamp. You can download a stereo mix for any price you like – including for free! If you’d like a multichannel file for full surround sound immersion in the wonderful soundscapes we recorded then for a small fee you can choose from a variety of multichannel formats including ambisonic B Format. Oh and there’s a bonus binaural mix too for those headphone moments. 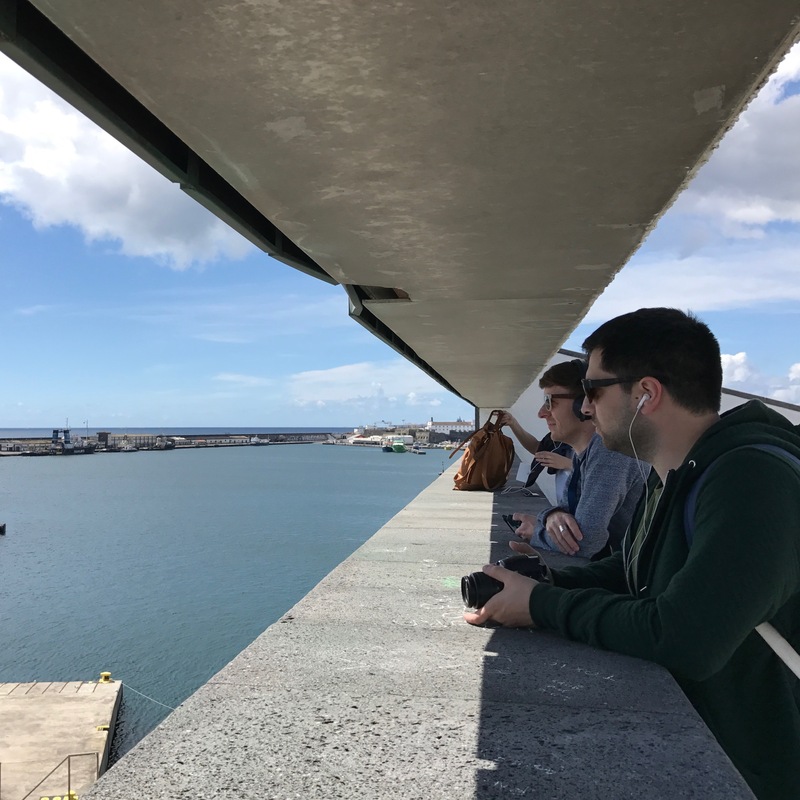 I’ve just returned from a trip to São Miguel island in the Azores where I devised and led a soundwalk as part of Invisible Places 2017. 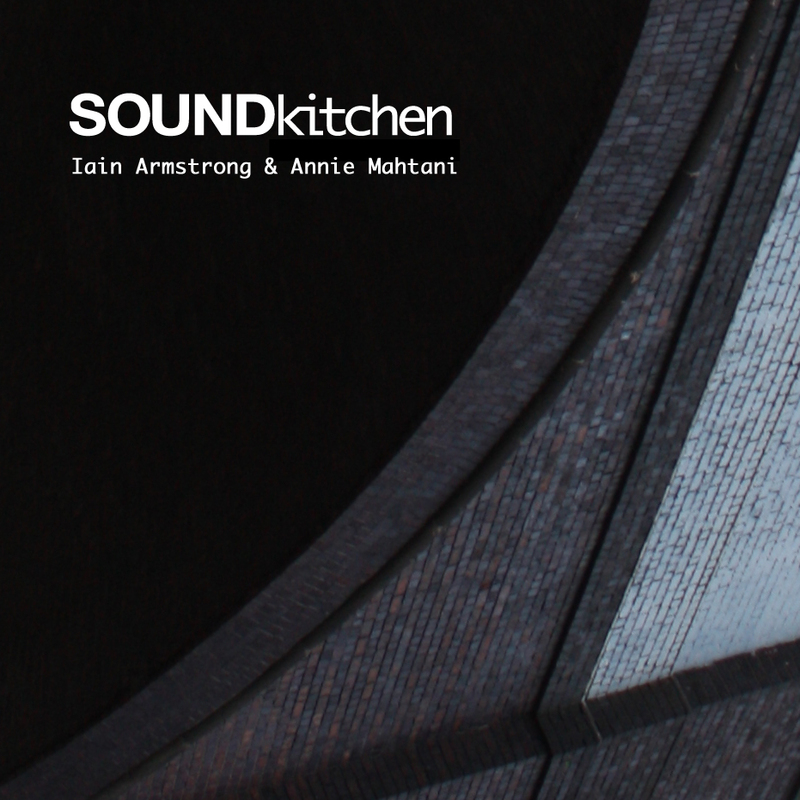 I worked with Annie Mahtani to create the walk under the SOUNDkitchen banner. We’ve documented the walk on the SOUNDkitchen website so if you’d like to read more click here. There’s a nice review by Nathan Thomas of the SOUNDkitchen event on 13/09/14 over on the Fluid Radio website. It includes some positive thoughts on my performance with Annie Mahtani. We are looking forward to performing an 8 channel version at the Metanast event at MediaCity on Friday. We played a similar set in Montpellier earlier this year and there’s an excerpt of of this performance on soundcloud. I have a couple of gigs coming up performing with Annie Mahtani as SOUNDkitchen. We will be playing a live laptop set mixing and manipulating field recordings with live electronics. The first gig is Sat 13 September at SOUNDkitchen Series #03, at VIVID Projects in Digbeth, Birmingham. Also on the bill are local AV act Formuls (James Dooley and Matt Parker) and a new collaboration between electronic musician Ben Ramsay and bass player Chris Mapp. The second performance will be at Metanast in the Digital Performance Lab at Media City UK, Salford on Friday 26th September. This event includes two concerts, the first presenting acousmatic music diffused and the second features live performances, both on a 16 channel system. We’ll be performing a multichannel set for this event alongside artists such as Robert Curgenven and Rodrigo Constanzo. I’ll be performing at Electric Spring, an annual week-long festival of exploratory electronic music held at the University of Huddersfield. I’m playing in a duo with Annie Mahtani under the SOUNDkitchen banner. Our 45 minute live set will explore a slowly changing soundscape comprising manipulated found sounds and field recordings and will be presented in 8 channels to take advantage of the HISS multichannel speaker system. We are playing on Sunday 2nd March at 19:30 in the final concert, the culmination of a week which features David Toop and Minoru Sato, Sylvain Pohu and Hannah Hartman, Autistici and Ambrose Field and others. The full programme is available on the Electric Spring website. A recording of this performance is now available to download from Bandcamp. An number of the recordings are also available in an unadulterated form on my Gruenrekorder release ‘Sacred & Profane’. I’ll be performing with Antti Saario as Anvil & Stirrup at two events next week. We’ve been working on a new set that uses field recordings and found sounds, live processing and a gestural interface using live audio to trigger samples in a max patch. On 23 May we’ll be playing at SOUNDkitchen at the Hare and Hounds in Birmingham. 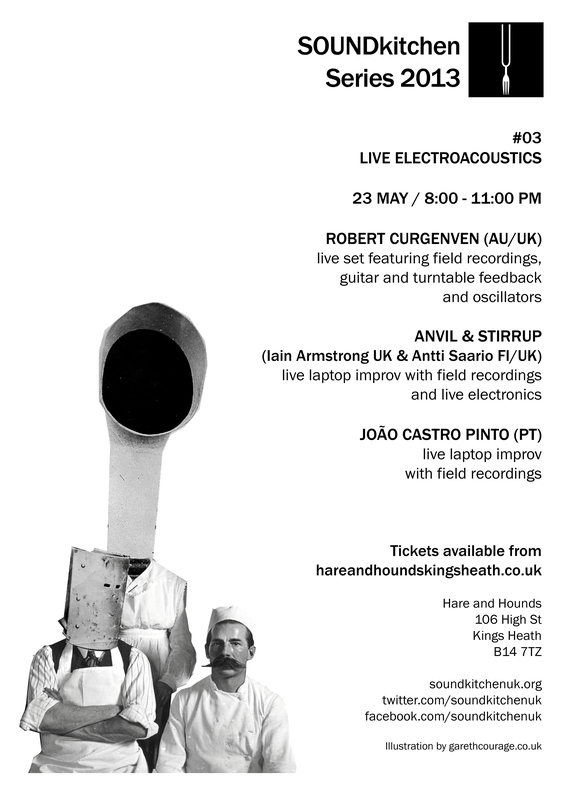 It’s a great line up with Robert Curgenven and João Castro Pinto also on the bill. The gig starts at 8pm and there’s more info and a ticket link on the SOUNDkitchen event page. The following evening we are excited to be playing at Resound, part of the Site 13 Festival run by Stroud Valley Arts. The gig is at 7pm at Goods Shed in Stroud and we’re sharing the bill with Robert Curgenven again and Matt Davis. There’s more info on the Stroud Valley Arts website. I’m looking forward to performing with SOUNDktichen at The Forum in Norwich on 29th January as part of the Sonic Arts Series No.71 run by University of East Anglia music department. We’ll be presenting a live multi-channel performance in response to the theme of ‘Acoustic Architecture’. Working with field recordings, live processing and spatialisation we will explore three sonic spaces. Travelling between natural environments, man-made structures and unreal soundscapes, the performance ends in and entirely abstract soundworld that plays with the spatial and acoustic properties of the Forum itself. I’ll be performing with SOUNDkitchen’s James Carpenter and Julien Guillamat. Also on the programme are performances from Diemo Schwarz (IRCAM), Sebastian Lexer and the university Sonic Arts Ensemble. More info on times and tickets here.